10 inch [25cm] diameter beret to fit a 22 inch/56cm circumference head. The whorl that inspired this hat was made by the Sami people of the Arctic Scandinavian region, and noall’te is a Sami word for spindle whorl. 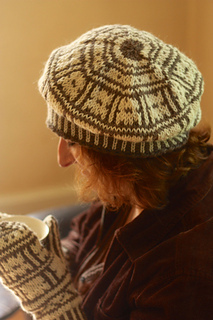 The flat whorl, etched with lines and dots radiating from the shaft hole, called out to be a jaunty colorwork beret (accompanied by a Scandinavian-inspired pair of mittens!) The yarn, Classic Elite MountainTop Vista, comes only in natural, undyed shades, perfectly reminiscent of the stone whorls of the Sami. 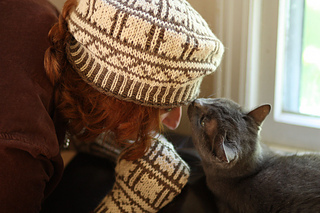 Knit in the round, decreases, stranded colorwork.